Sunday started with rain in the forecast. 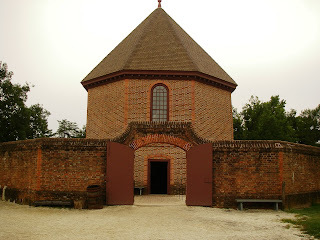 We went sightseeing in Colonial Williamsburg. It was the capital of Virginia before and after the Revolutionary War. 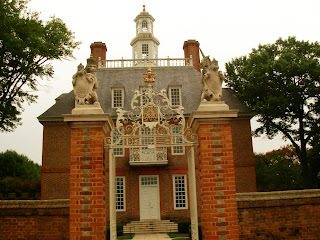 The most impressive original building is the Governor's palace; it was the largest building in the town and had large formal English gardens in the back. Approximately 1/3 of the buildings are original (the brick ones) and 2/3 have been restored (the wood ones) since 1926 when John D. Rockefeller Jr. took an interest in preserving Williamsburg. One of the unique aspects of Williamsburg is the people who represent the craftsmen, proprietors, townsfolk and historical figures. 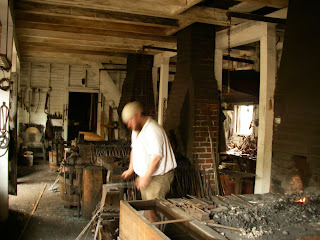 There was a blacksmith (pictured above), a shoemaker, saddlemaker, cabinetmaker, and apothecary that were practicing their trade in their shops. They showed us their work and answered questions about the town from a historical perspective. The magazine and armoury were housed in one building and the collection of flintlocks was gorgeous. There were also Brown Besses, a famous musket, on display. The capital building reminded us of buildings in Amsterdam. 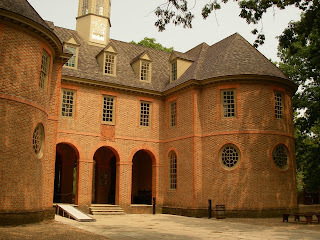 This was where the Declaration of Independence was presented to the people of Virginia. We finished the day with a briefing from General Washington on the strategy for the siege of Yorktown.